The Gowanus Lounge: Ford Flambée: What's Up in Park Slope? 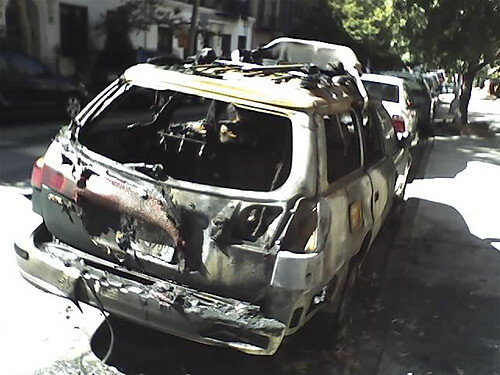 There have been a number of cars set on fire in Park Slope and Gowanus in the last week, mostly on Sixth Streets. Some of the torchings have occurred between Fourth and Fifth Avenue and some between Third and Fourth Avenues, making them Gowanus arsons rather than Park Slope ones. Our friends at Brownstoner posted about them yesterday morning, beating us to the punch by a few minutes over at Curbed. Later in the day, we posted a follow-up we received, along with some narration from a reader who happened to have one of the cars go up in flames right outside. Along with the reports of arson, we also saw reports of an increase in burglaries. So, is Park Slope in the middle of a crime wave? Not really. The arsons are very disturbing, but we checked Compstat for the 78th Precinct and found a 56 percent increase in burglaries reported during the last month over the same period in 2006, but decreases in other reported crimes. (In terms of numbers it's 25 burglaries versus 16 in 2006.) The numbers are current through September 23. Overall, burglaries are up 10 percent for the year. To put it in historical perspective, there were 1,644 burglaries reported in the 78th Precinct in 1990 and 191 last year. There are no figures for car arsons, though. Sautéed Suburu is a little more appropriate.